Historic day: Rockhampton Catholic Education director Leesa Jeffcoat with Sisters of St Joseph in front of the Centenary Mural. MEMBERS of the St Joseph’s Primary School community in Blackall celebrated the school’s 100th anniversary with a host of events on July 21-22. The Sisters of St Joseph started the school in 1917 when Blackall was still part of the Archdiocese of Brisbane. It became part of Rockhampton diocese in 1930. 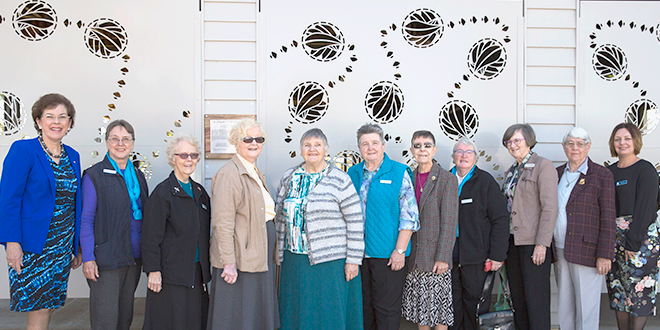 “The charism of the Josephites is very much a part of the rich history of the school, and our celebrations will certainly reflect the impact and great contribution the sisters made to the community and the beautiful gift of faith they have passed on,” principal Joanne Davison said. A highlight of the weekend was the unveiling of the centenary art piece at the school following Mass and a luncheon in the St Joseph’s MacKillop Garden. Commissioned artist Therese Flynn-Clarke has used large sheets of aluminium to create Rosary beads, an iconic feature of the Josephite habit, to be installed in the school grounds. The Rosary Cross will be reflective, so students can see themselves mirrored in Christ, and the beads will feature gum leaves, signifying the Australian bushland. “The work pays tribute to the legacy of the Sisters of St Joseph and their work with the children of the west,” Mrs Davison said. Celebrations included a Centenary Mass, school tours, a memorabilia display, old-school lawn games, a meet-and-greet evening and roll-call of past students.